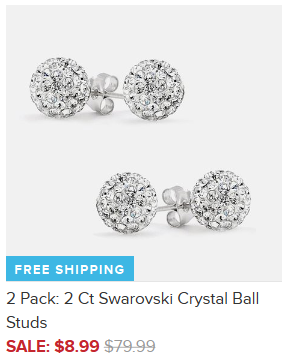 2 Pack: 2 Ct Swarovski Crystal Ball Studs Only $8.99 + FREE Shipping (Reg. $80)! You are here: Home / Great Deals / 2 Pack: 2 Ct Swarovski Crystal Ball Studs Only $8.99 + FREE Shipping (Reg. $80)! Wow, what an amazing deal for these! Grab a pair of these gorgeous 2 Pack: 2 Ct Swarovski Crystal Ball Studs for only $8.99 + FREE Shipping (Reg. $80) right now! At this price, you can keep one pair for yourself and give one as a gift!